Thank you for purchasing the Makes and Models Sync extension for WP Car Manager. 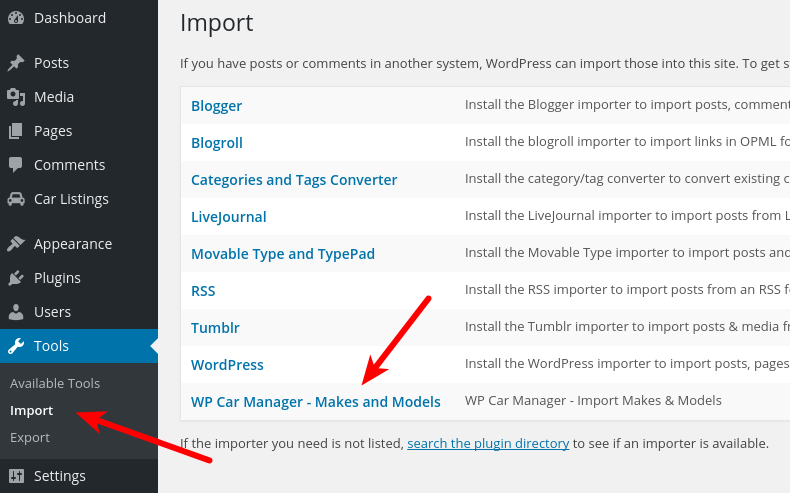 With this extension you can import up to 60 makes and over 900 models into your WP Car Manager website. You can find the import screen via Tools > Import. On the import screen you can select what Makes you like to import. The extension will automatically import all Models of the Makes you are importing. If a Make already exists that you selected for import, the extension will still import all of it’s models that don’t exist yet. Select the Makes you want to import and press the ‘Import Makes & Models’ button. What happens if a Make/Model already exists? The extension checks if a Make or Model already exists before importing it into your website. By doing so we’ll prevent the creation of duplicate Makes or Models. Note that if a Make already exists that you selected for import, the extension will still import all of it’s models that don’t exist yet.